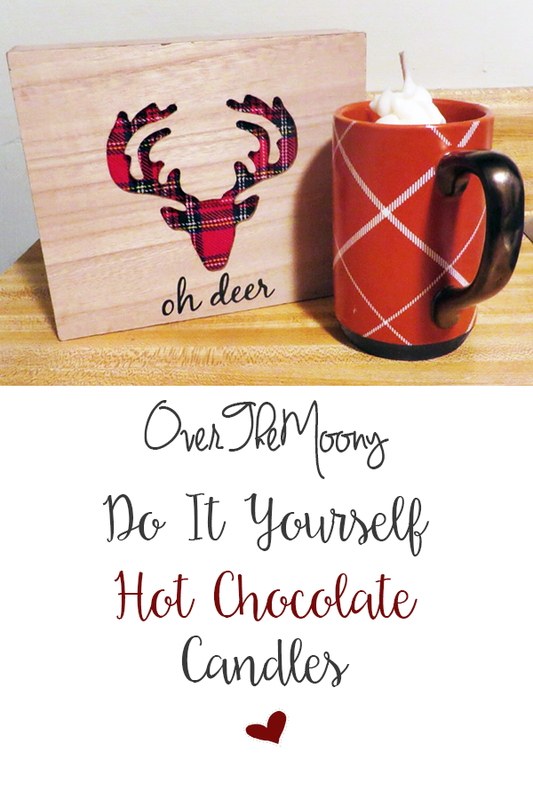 If you checked out my Winter Survival Kit Gift Set post last week, you may have noticed a cute little hot chocolate candle. 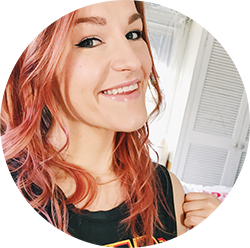 I promised I would be telling you how to make it this week so if you'd like to find out how, keep on reading! These are crazy easy to make and is a great project to do over the weekend since it's a lot of hurry up and wait with letting the wax dry. First thing you will need to do is melt your wax. Since I was making five at a time, I filled up my measuring cup as much as I could, which ended up being two cups. Once it all melted, however, it only ended up being about a cup. The first time I put it in the microwave, I heated it for 1 minute, then took it out and stirred it, and then repeated these steps but at 30 second intervals instead. Continue to do this until the wax is completely melted. Once your wax is melted, it is time to color it! I got some cheap crayons from Michael's, and I will say that I noticed a difference between these and Crayola. The paper was much harder to get off and they seemed like they were kind of coated. Regardless, they did the trick. Again, because I was making five candles I used several different shades of brown. I ended up using one crayon per every melting cycle I went through. Break the crayon up into pieces and drop them in. Stir the wax until you get the color you like and all the crayon pieces are melted. I will admit that it is a little difficult to see when you're using dark colors but use your best judgment. After the wax is colored, you get to add your fragrance. There are directions on the back of the package but I'm the worst at math so I just used the dropped that came with the oil and put 4-5 droppers-full into the wax. I then stirred the wax for about a minute to allow the fragrance to bond with the wax. The last thing to do before pouring the wax into the container is putting the wick in there. Put some glue around the metal part on the bottom and put it in the center of your container. If you have a wider container, you might need more wicks in order to have an even burn. Your wick will more than likely start falling over to one side. Use the Popsicle sticks to keep it center. You can even cut down some of the wick if you need to. Let the glue dry for a couple minutes and then get that wax in there! Word to the wise: pour slowly. I poured too fast and I got some holes at the top of a couple of my candles. Also, make sure to leave room to add the whipped cream without it really sticking up too high above the rim of the container. Speaking of the whipped cream, once you have all your candles cooling and hardening (which will take 2-3 hours depending upon how big the candle is), you'll want to melt some additional wax that will be used for the whipped cream. I did about a cup and a half worth of wax flakes for five candles so use your best judgment. You can choose to put fragrance in this as well but you don't have to. I think it's fun to put a different fragrance in the whipped cream than in the hot chocolate so you get the layered candle effect. Then you're just going to let this harden (which will take 1-2 hours). Once everything is done hardening, you're going to throw the whipped cream wax back in the microwave and then you're going to whisk it with a whisk or a fork. The first batch of these candles I made I put the wax in for 30 seconds. After whisking it for a little bit, I still found it to be a little chunky but I think it looks more like the whipped cream that comes straight out of the can. It looks a little more texturized. The second batch of candles I made, I put the wax in for 45 seconds and I think I may have whisked it for a little longer than I should have since it ended up being a little more fluid than I wanted it to be. I think this ended up looking like more melted whipped cream that has been sitting on the hot chocolate for a little bit. I think both look good in their own ways, but it's worth playing around with. It's also worth noting that I have a lower wattage microwave so if you have a higher wattage microwave you might not want to put it in for as long. In order to get the whipped cream topping, you're going to put your melted and whisked wax into a plastic or piping bag. Cut off the tip of the bag and then start decorating! You want to make sure to put the whipped cream right around the wick. You can go as crazy as you want. Just have fun with it! You're obviously going to let that wax harden for an hour or two, and then your candles are all set to go! Just trim the wick down to about 1/4 inch before you give it away as a gift or keep it for yourself. I really hope you give this a try. It's a lot of fun to do and it's so ridiculously easy and way cheaper than buying a bunch of candles if you're giving them out to a lot of people as gifts. I already have so many ideas for other holidays. Let me know if you want to see more posts about those candles as more holidays come up!